This version of the Rocket Firing Boba Fett was first brought to light by a former Kenner testing technician in the Nov 1994 (#20) issue of Action Figure Digest magazine. There he described what this final design iteration represented and why it ultimately failed Kenner's testing requirements. The mechanism was squashed by Kenner's legal department at the last minute due to these issues. Before this time, the only version of the elusive prototype known to collectors was the L-slot, named as such because of the shape of the slot in the backpack. This J-slot style of figure is essentially production-quality and factory painted with the copyright information stamped on the legs. Another example of this type of figure was found in sample form as a sample mailer. The 8-sided or 8-rib rocket that accompanies this style of figure is nearly identical to the one that was subsequently sonic-welded to the production action figures. The missile was modified for production with the addition of a small fin along the lower edge which allowed it to mechanically lock into the backpack during manufacturing. In contrast to the previous version, this figure's firing mechanism had a slot in the shape of a "J" so that the launcher could lock into place. This was designed to prevent children from accidentally firing the rocket because it required them to pull and hold the mechanism before firing. However the changed slot itself became an issue because the small stem in the center could be broken off and create a "sharp" hazard. A tiny sharp piece of plastic like that could easily get into an eye or scratch skin. The following image is an example of a test specimen where the stem had nearly broken off during stress testing and, in fact, many of the prototypes that remain today are products of that testing having either stressed or broken stems. 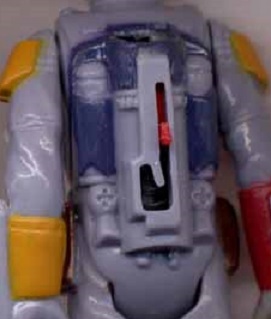 The bent/stressed stem figure shown here is actually the 1979 Toy Fair carded sample likely the only time the figure was ever shown to the public, although, at that point, the firing backpack was no longer a selling feature and relatively hidden in the packaging. People going through the showroom would have been blissfully unaware that the figure on the card had the elusive firing mechanism in-tact if only they could have looked at it from the side. Contrary to popular belief, the rocket-firing feature was not removed from the figure because a child choked on and died from a Battlestar Galactica toy missile. You can read all about that tragedy here.